We can use our knowledge of chiral centers to predict what types of stereoisomers molecules will make. Concept #1: Using chiral centers to predict types of stereoisomers. Now let's talk about ways to use chiral centers to predict the types of stereoisomers that we're going to get. All right, so it turns out that the types of stereoisomers can be roughly divided into how many different chiral centers you have. Let's go ahead and just talk about the most simplest situation which is that how about if you have a compound with no chiral centers. Well, earlier today I told you guys if there's no chiral centers, assume that it's achiral. That's still going to hold. As you can see here I said that compounds with no chiral centers are usually achiral. But now notice that I did put the word usually in there. It's because there is a subset of these weird molecules called atropisomers that we're going to pay special attention to later that happen to kind of break the rules and they happen to be chiral for other reasons. But other than that, most molecules can be really well-predicted by the number of chiral centers they have. If they have no chiral centers, then they're not chiral. Except for the case of atropisomers and I'll teach you exactly which ones those are. They're exceptions. So let's go on to the next category. How about if a compound has exactly one chiral center? Then that compound is always going to be chiral. Always. Always. There's no way to avoid it. And since it has one chiral center, that means that it's going to be able to form enantiomers. And remember what enantiomers were? They were the mirror images that you would get that were different from the original. The reason is because if you have one chiral center that means it's going to be able to arrange itself in two different ways: a right-handed way and a left-handed way. So what that means is if you put it up to a mirror, you are going to get the enantiomer because there's one chiral center. Now let's talk about the last situation. What if you have two or more chiral centers? Well, those are going to be usually chiral. As I've been telling you guys today, as long as you have chiral centers, assume that it's chiral. It turns out that there's also going to be an exception to that. The exception to that comes in the form of molecules called – I'm just going to point right here. The exception is meso compounds. But we're going to pay special attention to those as well. So what I'm trying to say here is that except for atropisomers, which are weird, and meso compounds, which are also weird, these rules always hold, which is that compounds with two or more chiral centers are going to be chiral unless they're meso. Now if they have two or more chiral centers, then they will not form enantiomers necessarily. They also have the ability to form what's called diastereomers. Now diastereomers are – it's a very weird word. What's the definition of that? 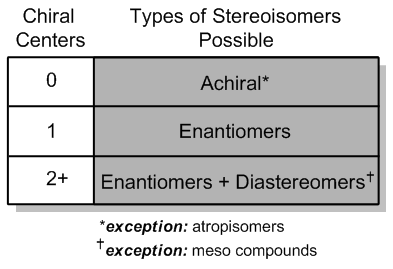 The definition of a diastereomer is simply a non-mirror image stereoisomer. So basically it's a stereoisomer that doesn't fall neatly into the enantiomer category. Remember that enantiomers are always 100% the mirror image of the other one. Diastereomers are anything that doesn't look exactly like the mirror image, but it's still a stereoisomer. Cool? And we're going to talk about the differences between enantiomers and diastereomers in a second. By the way, sometimes it's really fun to hear your professor say diastereomers because there's so many different pronunciations and a lot of them have to do with foreign accents and it's kind of funny. Concept #2: How to predict the total number of stereoisomers. Let's talk about one more thing and that's following the 2 to the n rule. It turns out that you can predict the total number of stereoisomers possible by using the 2 to the n rule where n is equal to the number of stereocenters. What that means is that you count up your stereocenters and whatever your stereocenters are you take 2 to the n, that will tell you how many stereoisomers you're going to get. So, for example, I'll just give you guys a really easy example, if I had 4 stereocenters, remember that a stereocenter could be a chiral center or a trigonal center. Both of those count as stereocenters. If I had 4 of those, then the total number of stereoisomers that I could get would be 2 to the 4, which is equal to 16 different isomers. Which is crazy. You're never going to be asked to draw 16 different isomers. But you may be asked to draw 4. Follow the 2n (n = stereocenters) rule to predict total number of possible stereoisomers. Note: Remember that stereocenters include both chiral centers and trigonal centers! Example #1: Draw all the stereoisomers for 2-bromocyclohexan-1-ol, and determine their relationships to each other. Determine the total number of stereoisomers for the following molecule. Example #2: Determine the total number of stereoisomers for the following molecule. Draw the enantiomer of the psychostimulant Focalin. Determine if each statement is true or false. Write (T) or (F) on each line, respectively. a. A compound which has a non-superimposable mirror image is a chiral. b. Stereoisomers which are non-mirror images of each other are enantiomers c. A meso compound is achiral and therefore must never have stereocenters. d. Products produced from optically inactive starting materials will always be optically inactive. There are 6 stereoisomers that have the name 2,5-dichloro-3-hexene. One of these stereoisomers is drawn in the box labeled “A”. Please note that this structure is drawn in a manner which shows the absolute stereochemistry clearly and unambiguously. In the box labeled “B”, draw the enantiomer of A. In the box labeled “C”, draw the ACHIRAL diastereomer of A in which the double bond has the (Z) configuration. In the box labeled “D”, draw the ACHIRAL diastereomer of A in which the double bond has the (E) configuration. Remember, a molecule is ACHIRAL when it IS superimposable on its mirror image! All of the structures that you draw should be line–angle structures! In each structure, use wedges, dashed wedges, and normal lines (as appropriate) to show the stereochemistry clearly and unambiguously. Bromocyclobutane is an achiral molecule. Draw 4 chiral cyclic constitutional isomers of this molecule in the boxes provided. Make sure to place your answers in the correct boxes such that the sterochemical relationships between the molecules in your answers are as noted. Which of the following terms best describes the pair of compounds shown: enantiomers, diastereomers, or the same compound? MARK WITH AN X EACH BOX THAT CORRESPONDS TO A CORRECT STATEMENT: (Notes: More than one box may be correct.) Diastereomers are enantiomers □, stereoisomers □ that are superimposable on their mirror image □, are not superimposable on their mirror image □, are not enantiomers □, and they are separable □, not separable □ from each other. 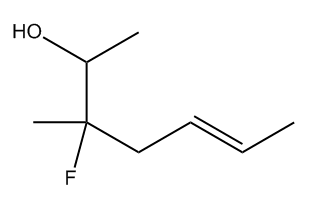 Draw an enantiomer and diastereomer of the following compound. Be sure to indicate which is the enantiomer and which is the diastereomer. Draw all the stereoisomers of 1,2-diaminocyclohexane. (The amino substituent is -NH2, e.g. aminomethane would be CH3NH2.) Indicate which pairs of stereoisomers are enantiomers and which are diastereomers. Correctly identify the absolute configurations of any chiral centers. (a) How many carbon atoms does an alkane (not a cycloalkane) need before it is capable of existing in enantiomeric forms? The structure of a chiral isomer is given below. Draw the mirror image isomer. Use wedge-and for the substituent groups, and be sure that the bonds convey tetrahedral geometry.